Quick and dry disconnect couplings provide a smart method of keeping fluids moving and eliminating spills or drips, which can cause significant danger to employees and harm to your equipment. Fluid handling, especially in chemical applications or for those under extreme pressure, needs to be properly managed. Use of dry and quick disconnect couplings provides an excellent safeguard for many applications. If you have special requirements, we offer a complete fabrication service that can create the custom disconnect couplings and peripherals your business needs. Dry link couplings can be used almost anywhere a hose is used to transfer fluids. The more critical it is to prevent a spill, the more likely you are to see one of these specialty fittings. 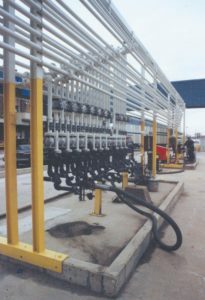 Applications tend to revolve around fluid transfers, fluid containment and movement when the equipment itself is portable and when fluids need to be redirected. OPW Dry Disconnect Couplings. OPW Engineered Systems offers a complete range of quick and dry disconnect fittings. Their selection is designed to meet hazardous and other fluid handling needs, with specific brands built to address different chemical applications. Series covered include Kamlok®, Autolok®, Kamvalok®, Drylok™ and Epsilon®. Dry Link Dry Disconnect Couplings. Dry Link builds couplings with the ability to prevent every drip and every spill. Their couplings are available in SS316, Alloy 20 and Hastelloy C materials to give protection and support for an extensive range of chemical applications. Specialty fittings such as dry disconnect couplings are found almost anywhere liquids exist in our industries. Our complete product lineup is designed to meet those needs in many common, and even a few uncommon, plants and applications here in the Midwest and across the United States.